The first thing that went wrong was me oversleeping. But I don’t oversleep. I have two alarms on my phone so that never happens. Friday morning I woke up a few minutes late. My first thought was that there would be no leisurely reading my local tv news app on my phone as I got my coats on. Exiting my bedroom hallway I saw the real problem. Orange flames lit my living room windows from outside. I thought our chimney was on fire, but for better or worse, it was the farm’s shop building. Like the smoke to come, the next part gets hazy. How do you lose your shirt, literally and figuratively, over the span of ten feet? Mine disappeared somewhere from my grasp in the panic. I could save my truck and skid loader if I hurried outside, but I dressed in slow motion and like a four-year-old, or, at least, it seemed like it at the time. My wife appeared holding the phone talking to the 911 operator. I’m sure words were spoken between us before that, but those moments are lost. I managed to call family on the phone in the melee and bolted outside. But I was too late. Fire licked the hood of my Ford and the garage for the skid steer was worse. The shop, the shop where my great grandfather milked, the shop where a small humbly made Bright Bros sign that my father and uncle had made when they were starting out hung, the shop that held our tools, supplies and many a problem fixed, the shop where hung the yearly marked growth sticks for each farm kid, was lost. I left my wife and kids at the house and saw my uncle rounding the corner huffing and white faced. This part is jumbled, too. I’m sure I told him the fire department was coming. And I remember there were sporadic pops and bangs coming from the fire as oil containers, WD-40 cans, and an acetylene tank exploded. I ran around the back side of the shop, taking the long way for safety, to inspect the calf barn. An upper door to the loft shone with fire in the darkness. By this time, there was no power to this barn and I fumbled with the water hose pulling it first outside and sprayed the door and then doubled back inside and drug it up the stairs to soak the same spot again. I ended up doing this twice more and I think this was when I burned my ankle which I never noticed until pulling off my socks that night. A siren blared over the fire and I hurried to meet them. I’m sure more family had arrived by this time to help however they could. Four fire trucks in all arrived refilling as needed at the nearby fire hydrant installed late last year, the only real sign of city water in our area. Let there be no doubt that these fearless men, my cousin among them, saved us. Their speedy arrival, experience, and get-it-done attitude prevented the fire from spreading further. They kept the fire from doing major damage to the hay barn, feedway, and the newly evacuated calf barn; family decided we’d take no chances with the calves and promptly shown them the exit door. As the fire at the shop became more and more contained, the possibility of the silo being on fire was raised. Smoke raced up the chute and billowed from the rounded top cap. Again and again, they sent bursts of water up the chute, stopping only to jump out of the way as orange glowing embers, formerly known as silo doors, fell. Eventually, they turned the tide, and we now feel only the doors and power cable suffered damage. The aftermath, or, at least, the aftermath that we are now experiencing is difficult, but even that is tempered by the generosity of friends and neighbors who are helping us cope. In the midst of the fire, the most important part of the farm was taken care of. We milked the cows. Then we fed the cows. I hope we did the best we could for them as we are asked to do. A thin line separates hope and fear, optimism and pessimism. Each of us has to choose which side of that line to be on. My family is safe. Our house is safe. We didn’t lose any of the other barns. The cows and calves are safe. We are fortunate. And I choose hope. So sorry for your loss. Thank you for sharing your story. I will be thinking of you all. The support of good friends like you make it easier. So scary! Thanks for being brave enough to share about it already. Glad family and critters are okay. Thinking of you in PA.
From one family farmer to another: So, So sorry for your loss. The word sorry seems so hollow it does not do justice for how I really feel. As I read your post tears filled my eyes because it hit so close to home. Thank you for sharing. One line really caught my eye: Then we fed and milked the cows, I hope we did the best for them like we are asked to do. You summed it all up right there! In this day of farmers taking flack for the way we raise the food that feeds the world you humbly and proudly did what we farmers do best…put our boots on and take care of what God has put in our hands to care for. In the span of hours you faced a tragedy and did a days work! Thank you for such and example of how to handle a tough situation with dignity. YOU have done us (farmers) ALL PROUD! You will be in our thoughts and prayers…Best of luck as you re build, I have no doubt that many blessings and future opportunities will come your way. your loss is a terrible loss to you personally and to the family. The building has had many uses and stood many years, not just a loss but a piece of your history. When we lost our large tool shed in a bad fire there was was a void for quite a while with material and memories. This will be experienced by you and your family as well. You will be remembered and we will keep you in our prayers through your trials and tribulations dealing with your loss with the fire. If there is anything I can help you with let me know Ryan. My thoughts are with you and your family. I admire your positive outlook. Glad you saved those important parts of your lives. Best of luck. My father was a dairy farmer years ago in upstate New York. My heart goes out to you for your loss. Let everyone know if we can help. My eyes welled up as I read this, reminded of a time when we also operated in that dazed sort of drive. Our bank barn wasn’t taken down by fire, but strong winds, with replacement heifers in the bottom when it fell. Just as you have experienced, family, friends, and neighbors helped all day long (and long after) to help us get it done. Keep choosing hope. Thank you for sharing your story. We can relate to your great loss. We lost our main milking barn many many years ago. Much of our hay was in that barn as well. We managed to salvage the milk tank in the milk house and the piping and feed troughs were still standing in the parlor. Late that night, and many thanks to hundreds of volunteers and DeLaval personnel we were able to milk that night. The cows were housed in a stall barn that was separate from the Bank Barn and milking parlor. We were forward planners, and had planned a new parlor in a few years on the opposite end of the stall barn. That came sooner than planned. The fire happened in June, and we milked from then until after the first of the year in that makeshift milk parlor where the fire had been. Milked under a tarp with a space heater to keep us warm in the dead of winter. We lost many tools and memorabilia, too, along with an amazing basketball court in the one mow. My husband’s father didn’t handle stress well, and he was ready to hang it all up. But, with God’s Grace and many hours of hard work, we all survived and our farm has thrived. To this day, nearly 45 years later we still think of things we lost in that fire. I will be praying for you as you go through this time of struggle, and one word of advice is to be sure that you have an excellent tax advisor on how to account for both the loss and insurance monies coming in. From experience on something bad to avoid, that is paramount! I am so very to hear of your loss. 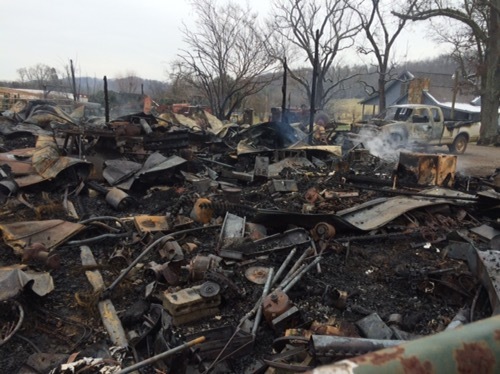 We suffered a barn fire this time last year and it was devastating, beyond any words. I raise dairy goats and had just kidded that week. Unfortunately, I lost my whole herd, 9 adult and 14 newborn kids. Our three beef calves and my buck goat were in an outside pasture and we managed to save them. Like you, the following days were a jumble of feelings and thoughts, and like you, we were able to continue on with our lives by the grace of God and the help of our community and neighbors. Again, like you, we were very grateful the fire didn’t spread to the house, although it did melt the siding on the side facing the barn. you and your family will be in our prayers. This will be a life changing event for you, one that you’ll never forget. God bless. I remember being a kid when a spark from a welder took wind and set our shelter belt alight. I remember not having enough water pressure from the well in a droughthy year to spray water. I remember being afraid the north-racing fire would reach our ranch’s fuel tanks. And I remember being so thankful when our fire department showed up…… glad the losses were relatively minimal. I’m really sorry. We had a devastating farm fire several years ago and were thankful, too, that no lives were lost. God bless as y’all sort through the mess and financial fallout. When there is a fire and you see so many of your memories burning, it is very heart breaking. When Grannie Ethel’s house burned, it was so far gone of course nothing could be saved either. Like your family no loss of life. The people that rented lost all. Dad was not farming any longer and we didn’t have to worry about keeping the farm going. There was so much love and laughter in that home and it was a symbol of the Giles Clan. I still miss seeing the white house and stopping everyday as I came home from work. Just know that my thoughts and prayers have been with all of you. Brings back too many bad memories from our barn fire just 16 months ago. We did lose the milking parlor and many wonderful people came through to take all the cows under their roof. Clean up and rebuilding was done by so many volunteers, not expecting any compensation other than to know you would do the same for them. 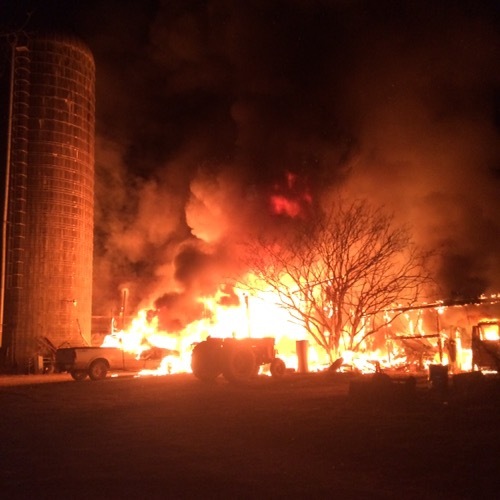 The photo you have of the flames and the silo looks so similar to our fire. There is no way to really thank everyone that will be helping you recover. You can just go on and do the best you can and let that show your thanks for their help. A fire like this is similar to a death of a loved one. Keep going, sleep when you can, eat to stay healthy. Hug your family. So well written, such a loss. Best Wishes to you and your family. Farming is hard enough with out this kind of stress. We are thinking of you! It’s another tough time but you will get through it. We are with you! Wow something tells me this was a post that was to be read. 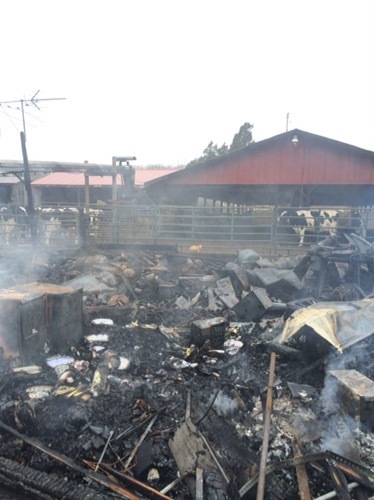 On Tuesday the 9th my BFF lost their family milking barn to fire. I received the call and flew to her farm to see devastation. Gone completely gone, I couldn’t speak just stood there holding her with tears streaming down my face. Their 6 year old automated barn was a mass of fire and tin. Three generations of hard work designing a new structure building it over the existing barn so that milking could continue. I stood strong for her, I ran around doing what I could and after I came home I wept for her wishing I could take her pain away, saying I can’t help her I don’t know what to do. I know your pain your disbelief and I truly wish you strength. My family and I cannot begin to express the thankfulness and appreciation we have for the comforting words and encouragement from everyone. We are humbled by your kindness. Ryan and Margaret and kids,I am so sorry to hear about the fire.You are all in our prayers. Let us know how we can help. Thank you, Sarah, for the prayers. They mean a lot to us.